Ryizeemmion Ford has become a fixture fighting in Youngstown on locally promoted amateur boxing cards including most recently on December 15 when he fought at the Saxon Club on the Southside Boxing Club's Season's Beatings amateur card. Today, Ford will be traveling a bit further to compete, as the 24-year-old Alliance native will be competing in Charleston, WV at the 2018 National Hometown Heroes Boxing Championships. sanctioned event in Charleston this weekend at the Beni Kedem Shriners Center as participants will be matched based on age, weight, and experience while being awarded gold, silver, and bronze medals as awards. Training under the direction of trainer Lorenzo Scott in his hometown of Alliance at the Common Ground Athletic Club, Ford won the won the 2017 Cleveland Golden Gloves title in the 132-pound open division, the same weight class he will be participating in at this weekends tournament. 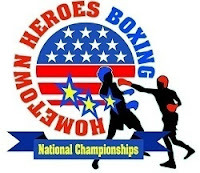 The mission of the Hometown Heroes Boxing Tournament is to provide recreational and competitive amateur boxing opportunities at the grassroots level for high school students, college students and individuals that are no longer in high school or college. All participants must be registered with USA Boxing.